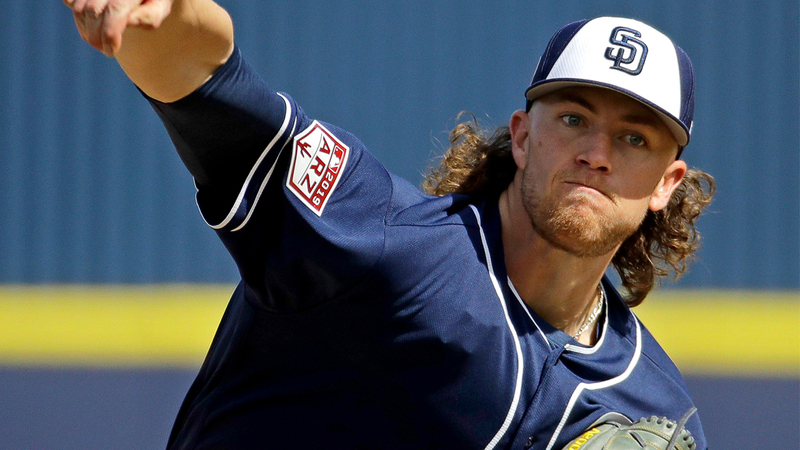 Chris Paddack is set for his Major League debut this weekend. In Monday's dry run, he looked perfectly at home on a big league mound. Baseball's No. 34 overall prospect allowed just one hit and struck out four over 2 2/3 innings in his final spring tuneup as San Diego blanked Seattle, 8-0. After the game, Padres skipper Andy Green revealed Paddack will start Sunday's game against San Francisco. Paddack got the Padres' nod at T-Mobile Park and retired the side in order in the first inning, bookending the frame with strikeouts of Mallex Smith and Jay Bruce. After fanning Edwin Encarnacion to open the second, the righty walked Domingo Santana and allowed a two-out single to Ryon Healy. San Diego's No. 5 prospect rebounded to fan Tim Beckham and induced groundouts from Dee Gordon and Smith before exiting in the third. Paddack already had made a convincing case for a big league rotation spot with his first four outings this spring, entering Monday with a 2.13 ERA, 20 strikeouts and two walks in 12 2/3 innings. The Texas native, an eighth-round pick of the Marlins in 2015, made 17 combined starts between Class A Advanced Lake Elsinore and Double-A San Antonio last year, going 7-3 with a 2.10 ERA, 120 strikeouts and just eight walks in 90 innings.